A wonderful night back in 2010. We just found Mary Doria Russell on Twitter and immediately dove back into our history to revisit this wonderful experience! Enjoy! Last night as the autumn winds blew and rain threatened The Bean and I enjoyed an amazing evening. The glowing lights of the City Opera House invited us into the hush of library-loving bibliophiles gathered to listen to this year's Traverse City Reads author, Mary Doria Russell. The first thing that suggested an interesting night ahead: seated on a couch --being photographed-- a woman and a dog. Dogs are not usually invited to such events, but this one seemed as welcome as anyone. A short legged, long haired dachshund, "half a dog high, dog and a half long--" taken right from the pages of Dreamers of the Day. But this dog wasn't Rosie, this dog was "Annie Fannie Sweet Feet". As soon as we had a chance, we asked the very approachable Mary who came first Annie, or Rosie? She shared that Annie was first and absolutely the inspiration for Rosie. She explained that she would have used the name Annie Fannie in Dreamers had an editor not advised against it due to the British-English definition of fanny. And so Annie became Rosie and Rosie became a perfect companion to Agnes Shanklin as she traveled from Ohio to Egypt, back home to Ohio and then onto her final rest in Egypt. Just as Annie Fannie is a perfect companion to Mary and her husband on a "working vacation" in Northern Michigan. I did not know that T.E. Lawrence in Dreamers of the Day was the "Lawrence of Arabia" and was sad to admit that I knew so little of a history that is so clearly connected to our modern times. Mary enlightened the audience with insights into writing historical fiction. She explained that she is a reader and read countless books which allowed her to use the actual words of Winston Churchill and T. E. Lawrence within the text of Dreamers. Including this famous line, "the dreamers of day are dangerous men, for they may act their dreams with open eyes, to make it possible." Dreamers of the Day left me hungry for history and full of questions. Audience members learned that Mary Doria Russell became a writer by way of life and the changes it brings (she's never taken a writing course). And became a great writer because she is a great reader and knows the importance of "giving (readers) characters to care about." The Bean asked if she had a regular writing routine or if she just wrote when inspired. Mary laughed and explained that her morning begins, "with two cups of coffee, two newspapers... then it is on to the computer... four hours of serious work." The evening was full of serious topics balanced perfectly by Mary's personality. Later while she signed my books I told her that my mom (The Bean) and I found her to be a delicious hoot --she laughed and said that friends told her "that if writing didn't work out she could pursue work as a comedienne." Anyone in the audience would be hard pressed to disagree, I admit to laughing so hard that I --The Bean as my witness-- snorted. 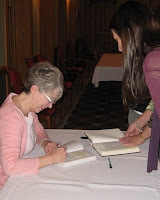 I asked Mary to sign my copy of Dreamers of the Day to The Sisters. So that when they are older and have questions about war, 9/11, or why there are places in the world that constantly fight, I will steer them to our bookshelf. Where they will find their own copy of Dreamers of the Day. Then I will share they story of last night, when I listened to an amazing woman tell us all about her journey through her life and into her books and into our lives. 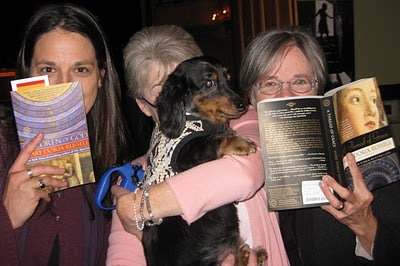 I will tell The Sisters that Mary Doria Russell is a "readers writer", a lover of dogs, and that she is a "hoot." I will tell my daughters that Dreamers is a book worth reading more than once and then I will set them off on their own journey. The next step of my journey is to watch Lawrence of Arabia and to read everything I can get my hands on written by the wonderful Mary Doria Russell. In closing The Books for Walls Project would like to thank Mary Doria Russell for being a sport and taking the BFWP style behind-the-books (dog!) photo with The Mom and The Bean. We'll never forget our evening with Mary and Annie Fannie! Mary will make one more appearance in the Traverse City Area this weekend at Brilliant Books October 23rd at 7pm, click for more information. For a comprehensive profile of Mary Doria Russell by Cleveland Women, click here. Please join in the conversation and add your comments below. I've not read Dreamers of the Day, but was very impressed with Thread of Grace. I'll definitely be adding more of her work to my list. oh, YAY!! i have definitely put her on my to-read list. and what a fantastic evening! Read all of her books! Each one is wonderful in a different way.